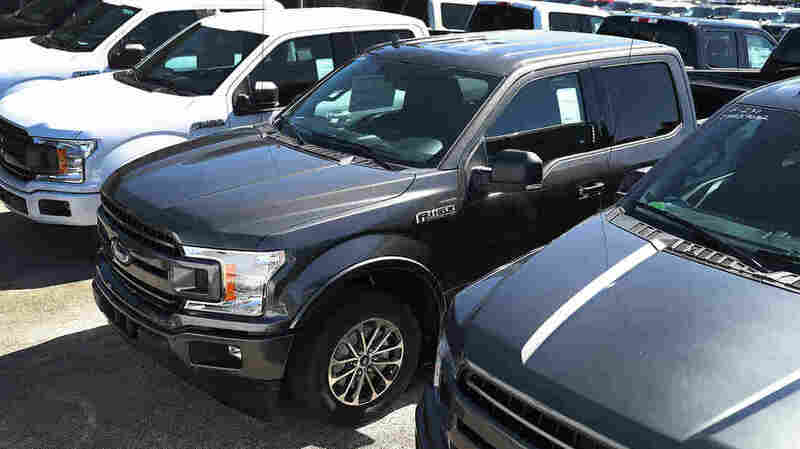 Ford Halts Production Of F-150s After Fire At Supplier's Facility : The Two-Way The most popular vehicle in America isn't rolling off production lines right now because of a lack of parts. Consumers won't feel the effect immediately, but it's unclear how long the halt will last. Ford F-150 pickup trucks are seen on Metro Ford's sales lot in Miami last October. The automaker had to temporarily halt production after a fire interrupted the supply of some parts. Ford has halted production of the F-150 pickup truck, the most popular vehicle in America, after a fire at a supplier facility last week left the automaker without a source for key parts. It's unclear how long the production halt will continue, but the company says consumers won't feel any immediate impact. A number of other automakers are also experiencing disruptions. A Meridian Magnesium Products of America plant in Eaton Rapids, Mich., was badly damaged by a fire and a series of explosions early in the morning on May 2. The Chinese-owned company said Wednesday it is "unable to provide additional information as to the cause" of the disaster. There were two injuries and no fatalities. Hundreds of people are temporarily out of a job at the plant. "The whole roof of part of the building blew out," Tracy Samilton of Michigan Radio reports for NPR. "It's gone. It could be some time before those people get back to work." Without die-cast components from that Meridian plant, Ford has been forced to cease production of F-150s in Kansas City, Mo., and Dearborn, Mich. — the only two plants where the vehicle is produced. Ford F-Series Super Duty production has been also paused at a plant in Louisville, Ky.
Chrysler, GM, Mercedes-Benz and BMW also say they have had production disruptions as a result of the fire, The Detroit News reports. GM, for instance, is halting production of full-size vans in Missouri. But Ford is getting the bulk of the attention — in part because the F-series is the best-selling vehicle in America, and the F-150 is the most popular, and profitable, vehicle in the series. "We are working closely with our supplier partners to do everything we can to limit the impact on our production," Ford Executive Vice President Joe Hinrichs said in a statement. Consolidation within the auto industry's supply chain laid the groundwork for a disruption like this, says Dave Sullivan, an auto industry analyst with AutoPacific. "It's like shopping at Costco — you buy in bulk, you get a lower price," he says. With one supplier making large quantities of a part, the cost is lower — but an explosion at one plant can knock out the entire supply chain. "Ford has about an 84-day supply of the F-Series truck in dealers' inventories, according to the company. That's enough that there won't be any shortages in the near term. "But if the shutdown lasts a month, buyers may discover the version of the truck they want — the type of engine, or the type of cab configuration or trim — won't be available. Those shortages are typical when vehicle inventory falls below 50 days." Sullivan tells NPR that the pause in production will have effects far beyond individual automakers. "It's very stressful for the entire supply chain," he says. "As Ford shuts down its factories, the orders going to suppliers dry up within a few hours ... that's how efficient things have become." After production resumes, automakers will kick into overtime to compensate for the loss in production, which will also be difficult for suppliers, he says. "The ripple effect just keeps going," he says. The news comes just weeks after Ford announced a major shift in its strategy, phasing out nearly all its cars to focus on producing SUVs and trucks. With Ford already scaling back car production, and its most popular truck now knocked out of production completely, "it's going to be a really tight squeeze this quarter," Sullivan says.